Mangaluru, April 24,2017: Speaking after inspecting the work on the new extension building of Lady Goshen Hospital in Hampankatta on April 24,Monday, MP Nalin Kumar Kateel said the work in progress l will be completed by June-end and the building will be opened for public use in July. He also said he has directed the contractor to speed up the work on the building. The work on the last floor of the building and ICUs are in progress, he added. However, the work failed to take off. Later, new building under CSR activities of Mangalore Refinery and Petrochemicals Limited (MRPL), and Oil and Natural Gas Commission (ONGC), the work on the building commenced in 2013. The MRPL-ONGC had given Rs 21.7 crore while the Union government, under National Health Mission, released Rs 10 crore for the work. The tender has been invited for Rs 10 crore and another Rs 3 crore work (which is pending from Rs 21.7 crore released by the MRPL). Though the work was stalled initially, later it was resumed after MRPL offered to sanction funds under its CSR activities, the MP said. The deadline for the completion of the work was extended several times. The work was delayed due to various reasons, he said. The MP said once the work on six-storey building is complete, then Lady Goschen will be a 600- bed hospital. The hospital will have all the state-of-the art facilities. "I have directed the officials to purchase new beds, for the hospital and not to shift the old beds from the hospital’s old building," he said. The officials have been directed to submit a proposal to the department of Health and Family Welfare for the purchase of new beds and other required materials for the building. The new block will ease space constraints of this hospital," he said. 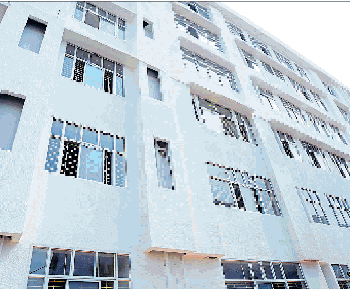 MP Kateel said that the inauguration of the building is likely to be attended by Union Health Minister J P Nadda, Minister for Petroleum and Natural Gas Dharmendra Pradhan and Chief Minister Siddaramaiah. MRPL MD H Kumar, DHO Dr Ramakrishna Rao and Lady Goschen Hospital superintendent Dr Savitha and others were available for discussions. It has already taken so many years for completion . Now if it is delayed the Government has to be ashamed of . Is so long period required for the construction of a Government Hospital.